It has been far too long since I’ve made a post! I’m sorry for being MIA but I fell in love with a 6lb 7oz blue eyed sweetie that I just couldn’t pull myself away from! With that being said, don’t forget to check out last week’s post for a gift guide to the mommies and babies in your life! 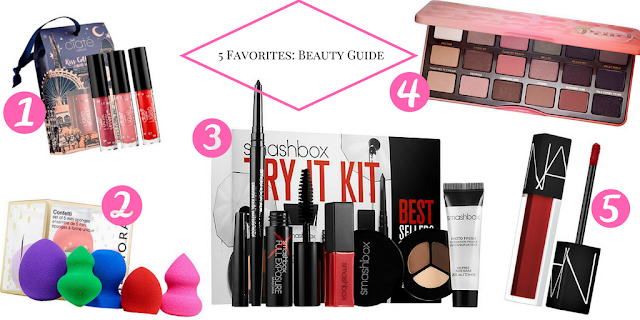 This Friday, I wanted to give you my five favorites from Sephora for the beauty lover that we all know or are…. I am a huge fan of Sephora, and Ulta too, but build up tons of points from Sephora. Don’t forget that Monday is the last day for most online stores to guarantee your package arrives before Christmas unless you have Amazon Prime like I do! Sephora also has Flash 2-Day shipping available – $10 for an entire year! 1. Minis/Samples – Let’s be real, I am a little makeup obsessed and this is always my go to store this time of year. I just ordered a little haul for myself and my SIL using my $20 off coupon that I get this time every year for being a VIB (which really just means that I spend too much money there). One reason that I love shopping online there this time of year is “25 Days of Minis” and well, samples in general. Today (12/16) is a NARS Velvet lipstick! Every day they have a free mini product that you can add to your cart! Sephora doesn’t do a whole lot of sales per say but they do have some great gift or stocking stuffer ideas. 2. Too Faced Sweet Peach – Something that I can’t wait to get from my haul is the new “Too Faced Sweet Peach Eye Shadow Palette”, not available in stores until 12/26! The entire Sweet Peach collection is so pretty containing eyeshadows, highlighters, lipsticks, & blush! Everyone was fawning over the Urban Decay Naked Smoky Palette and I was just waiting for Sweet Peach to come out! With my fair skin, the pink tones that this palette has are perfect. Also, you can never go wrong with Too Faced! 3. Ciate London Velvet Matte Lipstick – A great stocking stuffer that ended up getting for myself – ha – was the Ciate London Kiss Collective: Mini Liquid Velvet Trio. This is the lipstick that I was raving about not too long ago on my Instagram & Snapchat. I am not a huge fan of glossy lipstick and this is Velvet Matte. It went on beautifully and lasted 16+ hours through my morning coffee, meals, & drinks. I didn’t have to reapply it once! So when I saw a cute little mini trio for only $15, I knew I had to get it! Initially, I thought I would be nice and give it to my SIL for a stocking stuffer but I have since decided to be greedy and keep it for myself (eye roll – this is why I shouldn’t buy nice things). The trio has since sold out (of course) but you can still get the full size lipsticks that come in 13 different shades for $19 here. 4. Smashbox Try It Kit – Smashbox is another one of my favorite brands. I love their Iconic Photo Finish Foundation Primer. This year they have a “Try It Kit – Bestsellers” which is literally exactly what the name is. Sample (some travel & some deluxe) sized pieces of their best selling products and its only $22. It basically is basically a full face of makeup, minus the foundation, all in one kit! The entire kit includes the primer, eyeshadow trio (perfect for a full eye makeup look), mascara (this gives some serious lash volume! ), eyeliner, and lip gloss. 5. 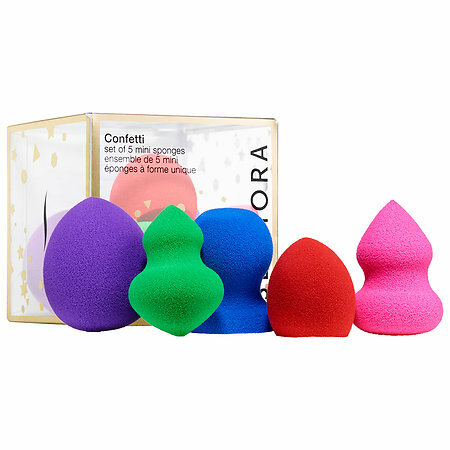 Blending sponges – For makeup sponges, I have found that I don’t need to pay $20+ for beautyblender sponges because the Sephora or other brands work just as great. You really have to know if your beauty loving friend is a fan of brushes, sponges, or both! I use the Sephora Collection blending sponges. Since I use them and love them so much, I wanted to get them as gifts as well. Right now, Sephora has a great mini set of 5 sponges for $12 – perfect for a stocking stuffer! These are great picks and I really love the Sweet Peach palette. Thanks for sharing! The Smashbox kit looks like a great deal. I love sampler sets like that. I love everything! Sephora is my weakness! I have that smashbox try kit and love it! Such great gift ideas! Love all your picks!